I'm feeling old and past it today :( I went for an interview with the career guidance company that is 'handling' me after my job was 'restructured' and he kept going on and on about how I shouldn't put dates on when I was at Uni, are dates on my first jobs ... because apparently people with half a brain will work out how old I am and those same people will be aghast at the idea of hiring someone in their early 40s!! Egads! Really?! Is that old now? I am in a serious career crisis if it is!! 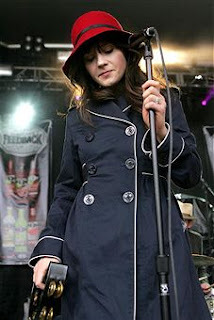 So I need some quirky fun today and who better to look to for that than Zooey Deschanel!!! Of course! 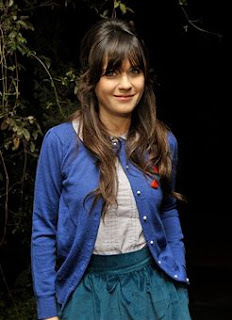 Zooey is 31 but he can still rock out the cute, quirky, retro look with the best of them and I want to borrow some of that vibe and give it the 40s treatment. Let's revisit Zooey first though cause she's gorgeous. 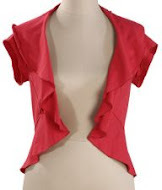 Got to get a red and white t-shirt with a diagonal stripe. I will, however, not be wearing a red bow on my head. 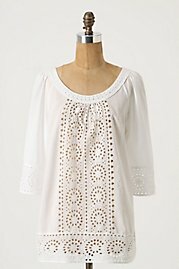 Broderie Anglaise in the form of this blouse from Anthropologie. 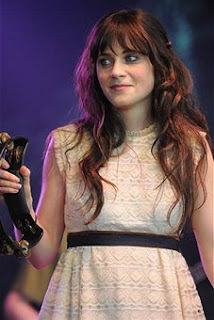 It's winging it's way to me as I type such is my inability to resist the lure of all things Zooey. A peak of flouncy pink skirt beneath a black jacket and above black tights and brown boots. 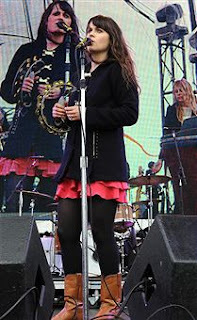 Not to mention a fabulous musical career! Complimentary jewel tones together. I haven't tried on a gathered skirt in ages, but this outfit makes me think I might.